We all know what a head-turner any car with three axles is. You could paint a convertible red and strap 12 reindeer to the front without attracting as much attention as a six-wheeled off-roader. But if that’s the route you want to travel, it will normally cost you a small fortune. A 6x6 G63 AMG weighs in at something like £380,000 and upwards. 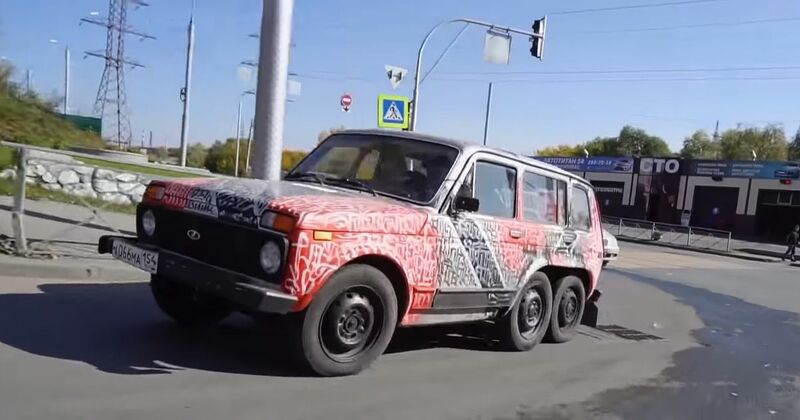 Fortunately, though, the Garage 54 crew is on hand to offer an alternative: a six-wheel drive Lada Niva. Getting the extra axle in there is relatively easy, too, or so says our Russian host. Of course, having a pre-lengthened Niva is a boost – this one already has an extra section welded into the middle. The problem comes with getting drive to that extra axle. After installing the extra suspension and axle, differential included, the team tests the six-wheel, four-wheel drive Niva out for weak spots that might cause trouble later. We’re not going to lie: the car looks absolutely epic everywhere it goes. The job of sending power to all six wheels is one for another video. We can’t wait for that.